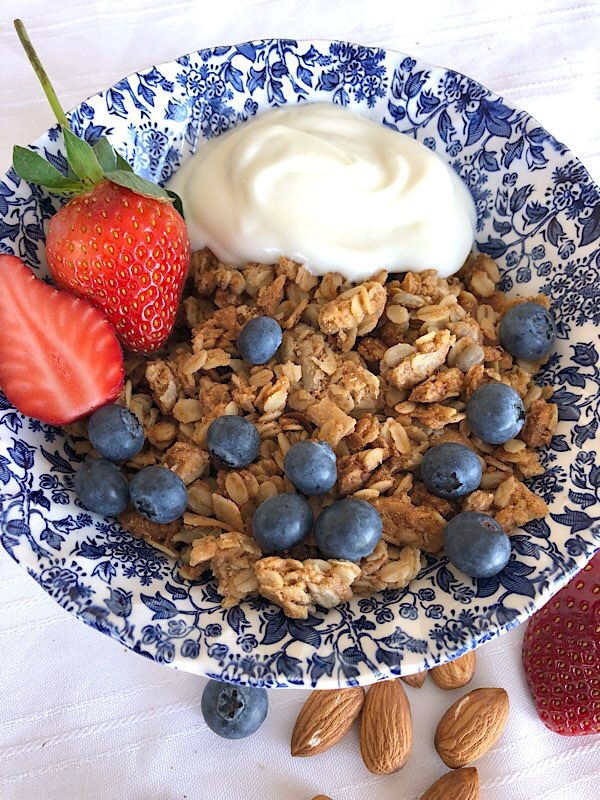 Roasted Almond Crunch, from Mulberry Tree, is a really crunchy roasted granola and an easy healthy breakfast with milk, almond milk or yogurt and fresh fruit. However it also is a high protein breakfast suitable for active people who want a low GI breakfast that will give them sustained energy long into their day. Roasted Almond Crunch is based on Almonds which are the most nutritious nut and a perfect taste for a low sugar breakfast. Almonds are 21% protein and a nutritionally dense food, containing a rich source (over 20% of the daily Needs) of the B vitamins riboflavin and niacin, vitamin E, and the essential minerals calcium, copper, iron, magnesium, manganese, phosphorus, and zinc. Almonds are also a source of the B vitamins thiamine, vitamin B6, and folate, choline, and the essential mineral potassium. They also contain substantial dietary fiber. Roasted Almond Crunch is loaded with healthy Australian almonds. Buy healthy crunchy granola direct from wholesale distributors and manufacturers Opera Foods.